← Is government planning to nationalize the pension system? In brief, there are scores of songs featuring rain, often not apparent in song titles. So what gives? To be sure, many of us find rain depressing. I knew a woman years ago who lived a year in Tacoma, and found she couldn’t bear it. Rain as a downturner is common even in some of our frequent idioms: “I don’t mean to rain on your parade.” Psychology confirms that rain can be a depressant and often employs a passed-around acronym, RAIN, to mark off the steps in overcoming the blues. But that isn’t the way rain usually works for me. Sure, I rail against it when it spoils picnic plans, etc., or when there’s too much, too long. On the other hand, I often find rain an elixir in slowing my pace, a catalyst to deeper thought bringing me into better contact with myself and spilling over into reassessed, more appreciative relationships with loved ones. In this sense, I think of rain as a sweetener, or sugar, that can actually enhance life’s daily brew. Rain gives me time-out. I suppose the latent psychology of this is why our movies so often foreground interims of reassessment as in The Bridges of Madison County. It’s like this in serious literature, too, where rain often assumes the role of archetype, or innate symbolization in humanity, regardless of culture. While rain can connote death as fate in Heminway’s A Farewell to Arms, a novel that both begins ands with rain, it more often intuits regeneration as in the ancient myths. Rain offers hope, if there is any, in Eliot’s The Wasteland, and the poem’s thunder towards its end augurs salvation. I can’t speak for you, but I love going to sleep at night to the soft snare drum of raindrops on the roof. And when I can’t have it that way, I’ll resort to my iPad Nature application with its bubbling brooks, ocean surf and, my favorite–the pitter-patter of falling rain. Who needs Ambien? Insatient Romantic that I am, I’ll often fall into these moods with the first gentle Spring rains of April, and just wish I could stay outside all day in it. 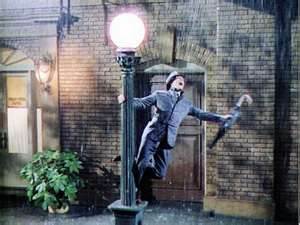 And when I’m actually caught in such a shower, I’m transposed into Gene Kelly, replete with unfurled umbrella, and I’m singing, yes, I’m singing in the rain!